We did the ghost tour of St Bartholomews Church and Graveyard in Prospect Sydney Australia. Three of us took photo's with three different cameras and we all captured apparitions and orbs. In the attached photo if you notice the large headstone on the left rear you can see someone leaning up against the left hand side of the headstone. The apparition appears to be male and you can see the background through him. No live people were ahead of us at the time as we were part of a tour and were not allow to venture anywhere on our own. 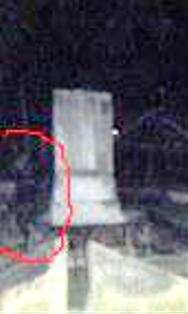 This photo along with others also show anomalies were sent to the tour operator who was not surprised, as the same apparitions have shown up before in other pictures taken on previous tours. If you zoom in about 50% you can see him clearly. I went to the church today 16/5/2010 as my ancestors are from the Warmuli or Prospect Tribe, traditional custodians of the land the church is built on. Two other people were with me and we all got the same picture/message. That this was a birthing place for Aboriginal women and my ancestor was born there. Out the back of the church there is a large tree (Sydney Bluegum) which has joined with another tree, very symbolic. Two of us were drawn to the tree (at different times) and both felt a sense of sadness, pain and anguish as if something tragic had happened there. Has anyone else had this same experience? Well Bogus, maybe you need glasses, because he is there on the left hand side of the pic next to the large headstone in the rear of the pic. And thanks for the pic. I can make out something in the background, but it's not clear. I tried enlarging it, but the image just breaks up.